How is it even possible that AirPods are still in stock on Amazon at a discount? You guys, we were wrong and we’ve never been more happy about being wrong. When Amazon shockingly slashed the price of Apple AirPods earlier this week, we said they would sell out quickly and they did. But then, somehow, AirPods were back in stock on Thursday and once again, they were discounted. We told you about the sale a second time, and thousands of people took advantage of this rare discount. But incredibly, they didn’t sell out again like we said they would! 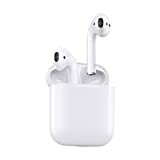 The Apple MMEF2AM/A AirPods Wireless Bluetooth Headset is somehow still in stock right now on Amazon at the lowest price ever, but we have no idea how much longer this deal will be available. Hurry!